Produced by ( Dri - FRIULI VENEZIA GIULIA ). 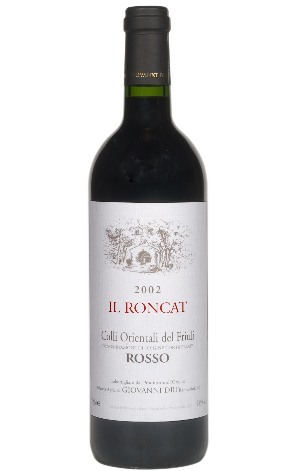 Finely blended grapes from four varieties all grown on Roncat hill within the Ramandolo area combine to make this intensely ruby, wine with purple overtones. It spends 18 months maturing in barriques which contributes rich scents of vanilla to the pronounced aromas of ripe, brambly, plummy fruit. On the palate, ripe berries and cherries are supported by velvety tannins. Macerated 30 days, aged 18 months in barrels mixed spent barrels. Using only autoctonous yeasts. And minimal SO2.